Julia Child: Bon Anniversaire Madame!! Back in early November of 1990, I was into my second year in France for an extended stay. Earlier, in college, I’d had a couple trips to France as part of my studies–once for a month, the following year for a semester at University of Dijon. But this was my post-college, what-the-heck-was-I-thinking-getting-a-math-degree? exploration of the culinary side of my aspirations. I’d signed on for a stagiaire spot at La Varenne and was lucky enough to be able to stay on after earning my degree, working on cookbooks with Anne Willan and calling Château du Feÿ my home for well over a year. That November, I’d heard Anne talking about the fact that Julia Child would be coming to France later that month, counting a night at the chateau on her agenda. And the date? My birthday. “What an amazing present that would be,” I thought to myself. 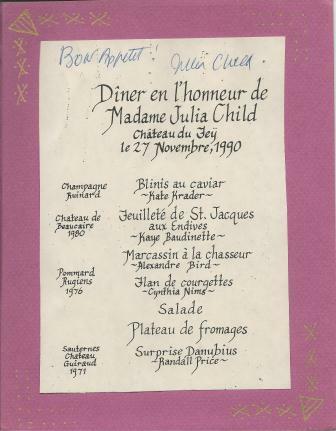 “Dinner with Julia Child on my birthday!” I set out right away at scheming up some way to wrangle my way into the dinner. Whatever it took, I imagined. Though I’m really not that great a schemer. In the long run, Anne asked me and some fellow La Varenners to create the evening’s menu and join them for dinner. So it’s just as well. That dinner, having a chance to spend a relaxed (well, mostly, once we were out of the kitchen!) evening with that phenomenal, wonderful, engaging woman — it was the thrill of a lifetime, no doubt about it. My first visit with Julia may have been trumped by another a few years later. A month or two ago, chatting with a group of food folks somewhere, someone asked if I’d seen the Julia Child kitchen display at the Smithsonian’s National Museum of American History. Yes, I said, then hesitated a bit before adding that I’d actually seen the kitchen when it was still in her home in Cambridge, Massachusetts. 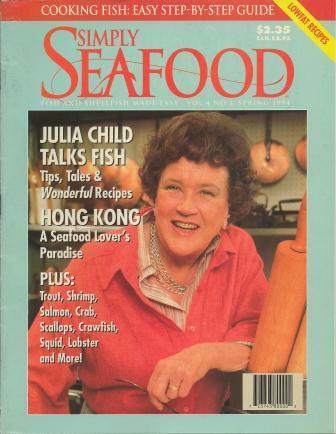 I had a trip to Boston in the works for December of 1993, doing some work related to my job as food editor of Simply Seafood magazine. Inspired by the geographic proximity, I reached out to Julia about interviewing her for an article for the magazine. To my great delight, she agreed. That’s how I came to be standing in that most famous kitchen, watching the gastronomic icon slurping oysters at about 10:00 a.m., using a little paring knife she’d pulled from the drawer. I wish I had a picture of that moment to share with you, but it’s one that I have permanently framed in my memory of that amazing day. A week or two before my trip east, seafood expert Jon Rowley had gotten wind of my plans and set me up with the most perfect of care packages, one he knew she’d love. So I arrived at her home on a chilly winter morning with an ice chest under my arm, holding a few dozen Olympia oysters, a couple first-of-the-season Dungeness crabs and a couple bottles of oyster-friendly wines from the Northwest. She was, indeed, in heaven upon realizing what I brought and wasted not a minute before she’d pried open the shells of one of those Olympias. I have Jon to thank for a particularly warm welcome I had from Madame Child! The resulting cover story remains, certainly, one of my all-time favorite articles. Made even more special by the invitation she made for me to head upstairs to the office to look through her photographs, picking a handful that especially echoed her appreciation of seafood. So lightening stuck twice. 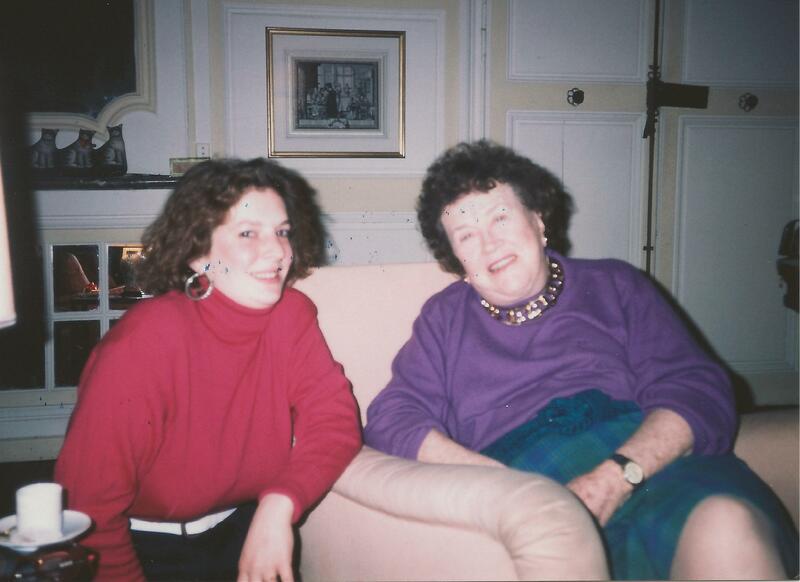 I was blessed to have two once-in-a-lifetime experiences with the inspiring, grounding, funny Julia Child. I saw her a number of times over the years, but those two are certainly golden memories I’ll always cherish. Happy 100th birthday to you, dear Julia. Thanks for the many years of joy you’ve brought us by way of your spirited and down-to-earth determination that good food matters, but so does not taking it too seriously. There’s room in our lives for everything from a good all-American hamburger (she wasn’t above the occasional fast-food hamburger, though does up a great French-style treatment as I wrote about here) to the tricked-out elegance of lobster Thermidor. There will be Champagne glasses clinking around the world in honor of your birthday next week. The food world would not be quite the same without you.